Resources — Teach the Beat! by Kip Lornell and Charles Stephenson, Jr.
University Press of Mississippi, 2009. The first book on Go-Go, The Beat set the stage for how we understand Go-Go. The Beat was originally published by Billboard Music in 2001. 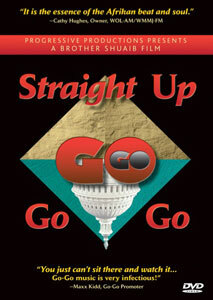 Go-Go Live explores the place of go-go within the development of Washington, D.C. since the 1970s. It is an important reference for teachers who are unfamiliar with go-go and for teachers who are seeking content on how go-go is part of a larger and international history of black music and culture. The book contains photographs and extensive excerpts from oral histories Hopkinson conducted. In Washington, D.C.'s 1980s go-go scene, The Black Hole was what CBGB was to punk rock, what The Paradise Garage was to dance music. You couldn't call yourself a true go-go head if you'd never stepped past its hefty bodyguards after wading through the mass of bodies stretching down Georgia Avenue whenever a show was happening. It was a hole in the wall, really — a former car garage that regularly packed in excess of 400 sweaty teenagers. And it was our spot to hear uncut go-go, dance all night, and be seen. SpeakeasyDC's Crank & Groove: A Go Go Love Story, an original combination of true stories, live music, and dance about one of Washington, DC's finest and most distinct cultural legacies - go go music. Performed in September 2013 at the Atlas Performing Arts Center in Washington, DC and partially funded by the DC Commission on the Arts and Humanities. Performances by Be'la Dona, Da Originalz, Patrick Washington, Nina Mercer, Christylez Bacon, Natalie Hopkinson, and Kato Hammond. Directed by Jess Solomon and produced by SpeakeasyDC Director, Amy Saidman. Keeping Go-Go Going in a Gentrifying D.C. chronicles how go-go legends like Anwan “Big G” Glover of Backyard Band, strive to attract a new generation of fans which includes new residents of the city. Keeping the history of the music alive while combating negative stereotypes are at the core of the effort. The episode includes interviews with Glover and Backyard Band members, Buggy, Sauce, Los, and Weensey. Length: 5:42. Aired: Nov. 28, 2015. Produced by The Atlantic.